Question: Do I/we need to buy a fishing license? Answer: No...Capt. Nathaniel have a fishing license that covers everyone that is fishing with him. Question: What will we be fishing with? Answer: It's all good...lures, fly, and bait. Capt. Nathaniel is an expert at all of the above. He welcomes anglers of all skill levels and will use whatever you prefer most, or whatever it takes to make the fish bite. At times our fish are very receptive to artificial lures…soft plastics, jigs, spoons, and topwaters. Capt. Nathaniel also caters to fly anglers of all levels. He is a fly angler himself and personally develops and ties his own flies. At times weather conditions, water quality, and angler skill level might dictate the use of live/dead/cut bait, in which case Capt. Nathaniel will provide bait and makes things easy for you. Regardless of whatever it takes to get them to bite, the Capt. will work hard to help you spot the fish, make presentations, and retrieve/work in the ways he's perfected for catching success. Question: What am I/we going fishing for? Answer: Well, what do you want to catch? Capt. Nathaniel plans fishing trips according to your goals and wishes, he doesn't do cookie cutter charters. He specializes in catching the big 4 game species of the region...redfish, speckled trout, tarpon and snook...on light tackle and fly, every day of the year. He also guides night-time fishing excursions for snook and trout. On day-time charters Capt. Nathaniel can also provide opportunities to catch black drum, jacks, flounder, and sharks. East-Central Florida has a fantastic inshore fishery with many different species available every day of the year. Question: When is the best time of the year to fish? Answer: There's never a slow time for fishing in Florida, we will fish every day of the year if the weather cooperates. Every month is great, each just varies in What's Biting (however tides and moon phases may dictate better fishing days). 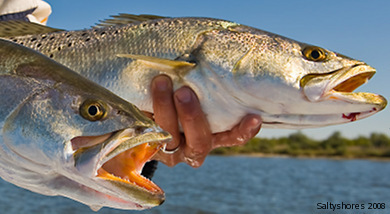 Our top 4 gamefish (redfish, spotted sea trout, snook, and tarpon) can be targeted at any time of the year. The size of each can and will vary from month to month. Contact Capt. Nathaniel to see what’s the hottest biting activity and then let him know your interests so he explain your options and target sizes available. Question: How many fish can I/we expect to catch? Answer: Capt. Lemmon guarantees to put you on the fish, in position to make the casts, and instruction on how to catch them. In many cases he can even help put baits in the right place to get a bite. When fishing with live bait, it would be extremely rare to not catch anything. Light tackle lure and fly fishing are much tougher. In addition, there can be many variables out of anyone's control that can influence biting activity. Question: Can I/we keep what we catch? Answer: Maybe. Generally Capt. Nathaniel is a catch-and release advocate. Many of the fish you will catch are part of our spawn population, so removing them will have a negative impact on our fishery. However, if you are set on keeping a fish, he will allow that within certain limits. There are some fish that the Capt. will not keep no matter what. Question: What about the weather? Answer: The best fishing is generally dictated by weather conditions and water quality. The best days have light winds, lots of sun, and active baitfish. As you can guess, moderate to heavy winds and overcast skies can limit our sightfishing opportunities. When the weather gets tough, we'll generally give up sightfishing and instead try to make the fish come to us with live or dead bait. Charters are only cancelled if the forecast and conditions are deemed too hazerdous and not risking safety. Question: Can I bring my kid(s)? Answer: Kids are welcome. Capt. Lemmon has raised 2 kids on the water, so he's very familiar having them in the boat. Some things to remember though. The trip should be for planned for and around them. Their hopes on the water are often very different from their experienced parent or adult. Sight casting tailing redfish, battling 100 pound tarpon, targeting trophy trout in shallow water, casting mangrove edges, etc. shouldn't be on the agenda. That doesn't mean we are going to spend a day catching tiny fish. But we should be going for more bites and constant action to keep them engaged. Please also be engaged as a parent. Their behavior is your responsibility.